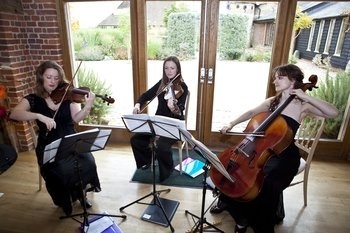 Rigaudon Music is a Surrey-based group of musicians who can form various ensembles, according to the size of your wedding and budget: a string quartet, string trio, string duo (violin and cello) and a piano with violin or other strings. We are happy to advise about the music for your ceremony and reception, as needed, to create the right atmosphere. If you are looking for professional wedding musicians at affordable prices in Surrey and surrounding areas, do look us up. Founded in 2006, we have played in hundreds of weddings and other events, and can guarantee that music will be truly wonderful on your special day. Fees for duos from £300, trios £400 and string quartet £500. Public Liability and PAT certficates available.